Online Resource O Children of the Light / Ay Farzandane Nur (Anonymous Farsi) Why not sing something in Farsi? This is simple enough if you just limit yourself to one verse and chorus in both languages. Sheet music, Farsi, transliteration and English translation (the English translation is not for singing). Sound sample on youtube (which includes a singable English translation). Good for kids. AoV2-060 / SFFS 2172 / HPP307 / GtG749 / G(II)518 / GC718 / GC(II)710 / G(3)807 Come live in the light / We Are Called (Haas) Joyful song of mission. Lyrics, sheet music sample and slowish sound sample here. I would double the speed of this (almost). CH763 / MV193 God bless to us our bread (Traditional Argentinian) A lovely simple grace for meals and for communion. More Voices has Spanish and French lyrics as well as English. "God bless to us our bread, and give bread to all those who are hungry, and hunger for justice to those who are fed. God bless to us our bread". This would be very appropriate if you are celebrating communion this week. Sound sample (Track 1). CH195 / StS053 / AA061 Here to the house of God we come (Murray) Good honest and challenging words and a simple, but unusual tune. Lyrics. Iona (Enemy of Apathy) / A&M466 / SP223 / StF654 / MP940 The love of God comes close (Iona) A good song of God's forgiveness. Simple melody. Lyrics. Very slow music sample. 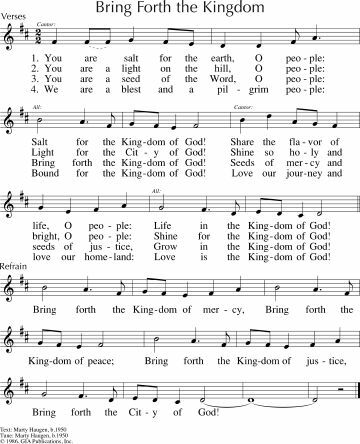 *TiS 69 Light rises in darkness when justice rules our lives (Kimbrough/ Young) A lovely Psalm response. Could be used with a sung or read version of the Psalm. The TiS translation is quite inclusive. It's from the United Methodist Liturgical Psalter (1989). ATOK 354 / ELW801 / SFFS 2152 / GtG695 / SP&P128 / W&R373 / PfAS051A / ZSS178 / Srce95 / MP069 Change my heart O God / Cambiame Senor (Espinosa) A mushy old favourite. Thanks to Sylvia Griffiths for this and the next few suggestions. Lyrics and chords. *SFFS 2129 / HPP322 / W&R344 / Cha344 / Srce2-244 / MP272 I Have Decided to Follow Jesus (Singh) Good simple traditional chorus. Do you know the story behind it? I didn't. Read it here. This Australian video from Perth has some nice chords. Oldy-but-a-goody. *URW223 (refrain 2) Like a tree that's planted by the water (African American) This simple and very well known refrain would work well with Psalm 112, even though this book lists it for Psalm 1. Good for kids. TiS 712 / AoV2-021 / ATE 269 / The tide has turned Create in us a clean heart O God (Hannah) Good. A big favourite in our congregation. Emergent Psalter Happy are they who fear God (Everett) A very simple Psalm refrain. Sample sheet music (refrain only). Iona (HSNW) / VU019 / A&M839 / SP326 Kindle a flame to lighten the dark and take all fear away (Iona) This song would also work well at various points in the service, including during intercessions. Good for kids Sound sample. *Taize / AoV2-091 When The Night becomes dark your love O Lord is a fire (Toolan) A lovely simple chant. Sound sample. BUC Song Project Take a deep breath / Deep in your soul (Anderson) A refreshing and simple song of the Spirit's transformative power. BUC Song Project Silent as the dawn / Spirit God you come (Loukes) Simple meditative song about the coming of the spirit. Beautiful images. TiS 626 / AHB 557 / CH500 / GA423 / Lau869 Lord of creation to you be all praise! (Winslow) A wonderful traditional and quite inclusive hymn to the familiar tune SLANE. Lyrics. Oldy-but-a-goody. TiS 418 / AoV2-075 / Iona (EoA, Common Ground) / CH593 / GA372 / A&M259 / Cha255 / SP94 / URW165 / StF393 / Lau305 She sits like a bird brooding on the waters (Bell) My favourite Holy Spirit song. Beautiful words and very easy to sing, provided it is not played too quickly The Iona recordings are generally very quick, but there are a lot of words to fit in, so keep it elegantly moderate in speed! Lyrics (scroll down). STB037 Thousands and thousands of songs / Aayirem aayirem padelgellei (Francis) This Tamil song from India has a catchy chorus, which could be sung in English or Tamil. Slightly tacky youtube sound sample. The sound sample is in Tamil, so that could help you with your pronunciation! TiS 414 / NCH294 / CH616 / UMH192 / VU582 / HPP134 / PH433 / GC550 / CP(E) 198 / Cha257 / StF398 There's a Spirit in the Air (Wren) A good song of getting the business of following Christ done. Speaking out, caring for others, being changed. A joyful tune (it looks less so in TiS, but think of it in 6/8 instead of 6/4). Just think how brave Naaman's servant girl must have been. Seven verses – you might want to have women sing a verse and men sing another to keep people going. The TiS suggestion to use INVERCARRY is (in my opinion) not necessary; it’s easier to the set tune. Lyrics and tune sample. BUC Song Project You the hope you the light / Send out the word (Brown) Not really a congregational song, but it's just cool and joyful. Would be good for the musicians to sing during the offering. *AoVNG52 / MV209 / GC(II)664 / G(3)775 / SP&P199 Go Make a Difference (Angrisano) Groovy sending out song. "We are the salt of the earth, called to let the people see the love of God for you and me" Sound samples on this page. Lyrics. Good for kids & teenagers. *AoV2-004 / NCH181 / GA478 / CP502 / G(II)468 / GC658 / GC(II)640 / G(3)734 / Lau854 You are a salt for the earth O People / Bring forth the kingdom (Haugen) Joyful song. "Bring forth the reign of justice, bring forth the reign of peace...". Sheet music. Sound sample. *AoV2-060 / SFFS 2172 / HPP307 / GtG749 / G(II)518 / GC718 / GC(II)710 / G(3)807 Come live in the light / We Are Called (Haas) Joyful song of mission. Lyrics, sheet music sample and slowish sound sample here. I would double the speed of this (almost). TiS474 / AoV1-012 / ATE 295 / CH623 / SFFS 2236 / HPP553 / A&M363 / GtG401 / G(II)539 / GC839 / GC(II)743 / G(3)848 / CP465 / W&R649 / Cha284 / SP175 / URW054 / Lau475 Here in this place new light is streaming / Gather us in (Haugen). Excellent words, very well known. “Nourish us well and teach us to fashion lives that are holy and hearts that are true”. Lyrics and sheet music. AoVK-40 / NCH524 / UMH585 / ELW677 / A&M808 / HPP466 / G(II)358 / GC514 / GC(II)514 / G(3)591 This little light of mine The AoVK version has excellent verses that actually make the chorus make sense, but will need to be practiced. Check them out if you have a copy. In the meantime, hear Bruce Springsteen sing it here. It's amazing... Oh, and here's another version. Good for kids. HiOS001 A pinch of salt (Gibson) This song is quite funny, and picks up this theme really well. It talks well about not over-doing things. "When you sprinkle it, just go lightly." STB254 / Hymns from the Four Winds: A Collection of Asian American Hymns #74 Light of the World, Salt of the Earth / Chu Li kau-tai goa kang-tia (T'in) This Taiwanese song has a lovely tune, but it's a little tricky. The English translation is quite formal, but good. If you can only handle one verse, sing the first verse. "But if salt has lost its taste, and the light its fuel, and the city shuts its gates, whence can come renewal". Perhaps one to encourage your musicians to present to the congregation; especially if you have anyone from Taiwan in your congregation! I would love to hear your ideas - please add them in a comment below, especially if there is a song you love that I haven't included. Sorry for the typo in my previous comment (should be version, not "vweaion"? A possible song, that I think fits the gospel, and is good for ending the service is 'Colours of Day' (Light up the fire); I think it is in Mission Praise, not sure of the number.